Last week, President Donald Trump proposed gutting California’s unique ability to write greenhouse gas emissions limits for cars and trucks. Now California is firing its own heavy artillery. The state plans to force carmakers to continue complying with Sacramento’s rules, even if Trump weakens those set in Washington. This decoupling, set forth in a regulatory filing to be released Aug. 7, is California’s biggest salvo in the escalating fight over Trump’s fuel-economy and tailpipe emission plans. It could spark years of litigation and create a patchwork of standards that vary from state to state. But Mary Nichols, head of California’s Air Resources Board, said she had no choice. “In case someone might think that the change in federal standards would make it easier to comply in California, it was very important for us to make clear that this is not the case,” Nichols said in an interview. Since 2009, the most populous U.S. state has allowed carmakers to satisfy its own greenhouse gas requirements by fulfilling national mandates set by the Environmental Protection Agency. California predicated this arrangement on the belief that Washington and Sacramento would continue aligning their rules and that neither side would opt for unilateral changes, according to the Aug. 7 filing. But the state’s Air Resources Board plans to vote Sept. 27 on whether to cancel this so-called “deemed to comply” provision. “California cannot accept radically less protective standards, especially because extensive analysis [of rules now on the books] demonstrated the current standards are entirely appropriate,” the state said in the filing. The state, which described itself in the filing as “an independent co-regulator for the light-duty vehicle industry,” already has locked in its tailpipe emissions rules through 2025 and is developing tougher standards through 2030. 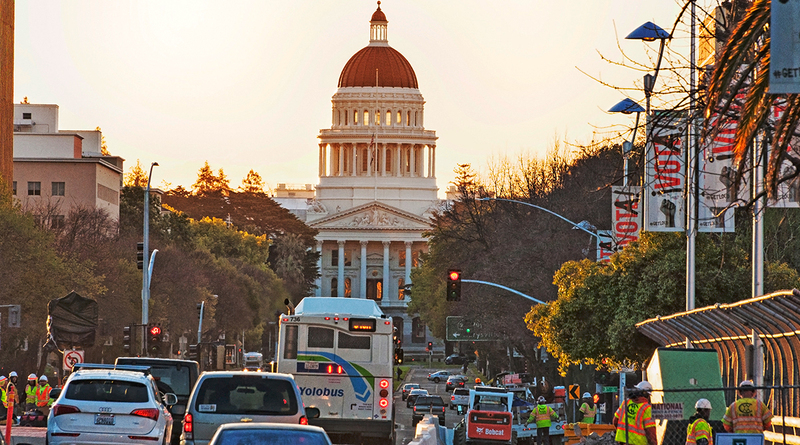 A dozen other states, which together with California constitute about a third of the U.S. vehicle market, have adopted tailpipe emission roles that mirror Sacramento’s. They would each likely take separate votes to follow the Sacramento’s decoupling, since most already have joined a California-led lawsuit to block Trump’s rollback. Last week, EPA and the National Highway Traffic Safety Administration proposed capping federal fuel-economy requirements at a fleet average of 37 mpg starting in 2020. Under the Obama plan, the average would have risen to about 47 mpg by 2025. The fuel-economy freeze would cap emissions standards, too. The agencies also proposed revoking California’s authority to set rules more stringent than the federal government’s and to mandate electric car sales. Nichols said she’s willing to negotiate but didn’t hold out much hope. To underscore her determination, Nichols said that if Trump succeeds in blocking California’s tailpipe regulation, the state could use some of its other authorities — including limiting vehicle registrations, fees and taxes — to seek greenhouse gas reductions. The state also could crack down on emissions from other sectors of the economy, including petroleum extraction and refining. In a call with reporters last week, Trump officials acknowledged that the 1970 Clean Air Act gave California unique authority to regulate ground-level ozone and other local pollutants that contribute to local problems such as smog. But the state’s special authority does not extend, according to Bill Wehrum, EPA’s assistant administrator for Air and Radiation, to global problems such as climate change. In a rebuttal Aug. 6, Nichols invoked what she called the“climate penalty,” that is, a decade’s worth of evidence that higher temperatures due to climate change are making ozone harder to control in specific locales such as Los Angeles.